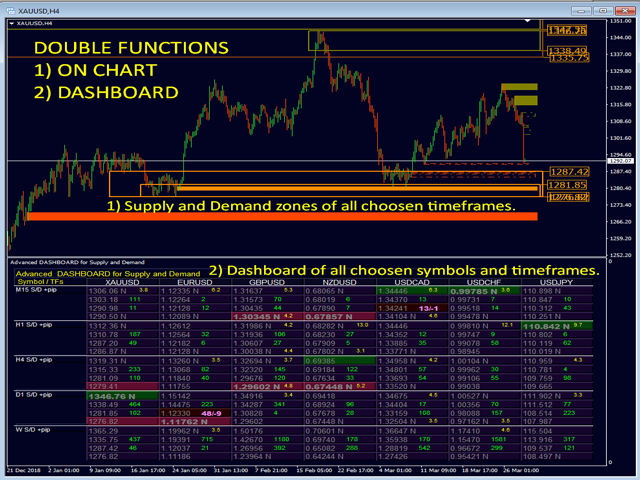 This DASHBOARD is a very powerful piece of software working on multiple symbols and up to 9 timeframes. It is based on our main indicator (Best reviews: Advanced Supply Demand). it gives 4 kind of alerts for the chosen symbols in all (9) time-frames. It is highly configurable for your personal needs! 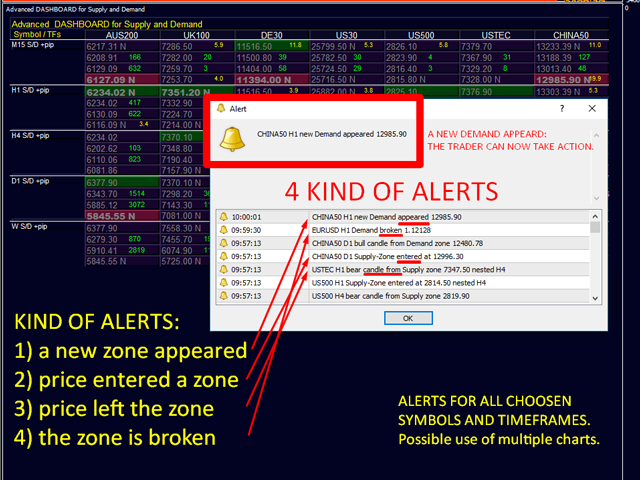 If you wish, you can filter all alerts for only nested zones. 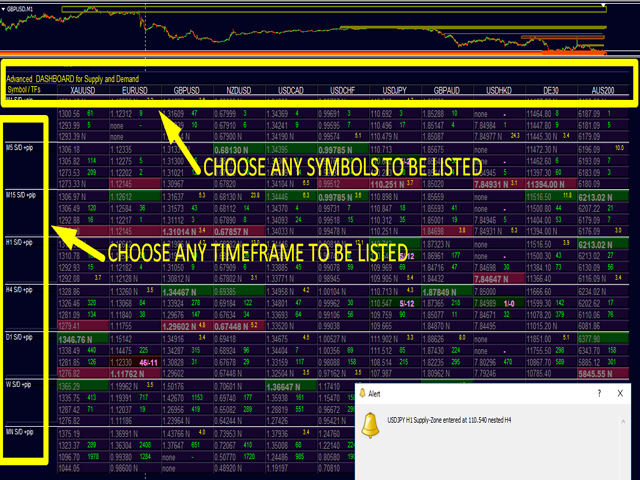 You can choose the timeframes which should be alerted. You can exclude symbols from the alert. 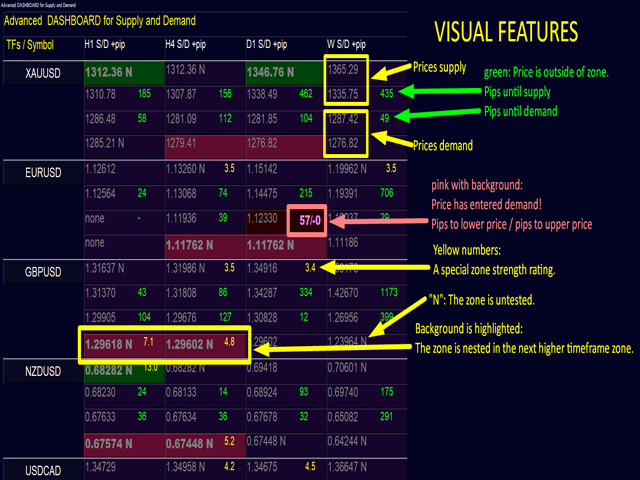 Pips distances until supply and demand. Green, if price is far from zone. A special zone strength rating. Yellow number, if a minimum strength is reached. New or tested: "N" is added to price if the zone is still untested or new. 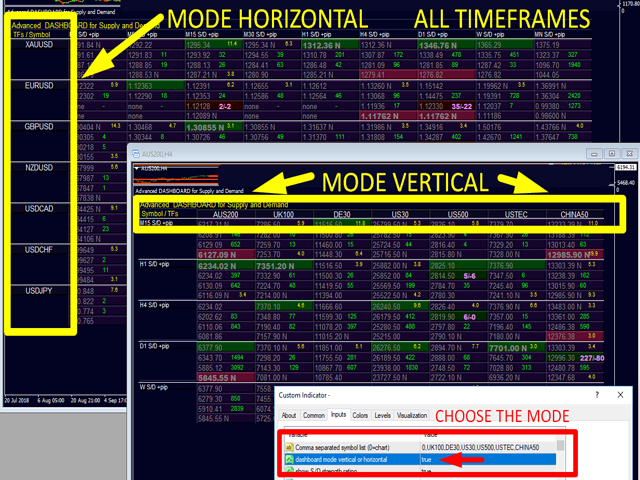 Nested: the background is highlighted if the zone is nested within the higher timeframe zone. Nested AND new: Prices for supply and demand showing in bold. Simply drag the sub-window of the dashboard down with the mouse to see the actual chart. Click on the symbol names to change the symbol. All timeframes showing in the dashboard will be drawing on the chart. Lower timeframes than the chart showing as dashed squares. Actual timeframe of chart showing as full squares. Higher timeframes than chart showing as empty squares. The higher the timeframe is the more to the right the squares end. Color code will show if the zone is new or tested. Prices can be shown on chart or not. The full list is available in the User Manual. Were are the best levels to enter the market? Enter your trade within or near a strong supply/demand zone to have the best chance of success and risk/reward. Where is the best place for my stop loss? Place your stop below/above a strong supply/demand zone to be the safest. What is my best profit target? Your exit strategy is just as important as your entry and knowing the higher time frame picture can help with this. For a buy use the next supply zone as target, for a sell use the next demand zones as target. Entering on a pullback to supply or demand to ensure that there is sufficient room for a profit margin up to higher time frame supply and demand will increase your profits. Why we filter strong and weak zones? The greater the imbalance, the greater the move in price. The highest probability price levels are the ones with the greatest imbalance between buyers and sellers. Without any prior warning, it reverses on the spot and drops like a stone – those are the areas of major imbalances. A big number of sellers have entered the market at that price and outnumbered the buyers. It is also very likely that, in case of a sudden sell-off, more sellers were waiting to sell just around that level. Read the User Manual: Click Here. 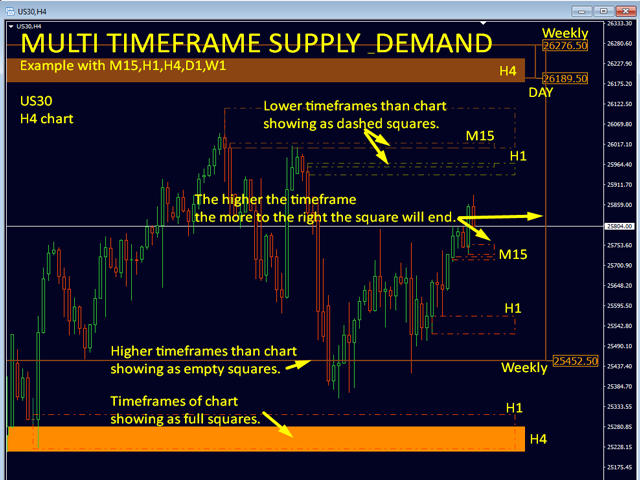 SPECIAL: To update the MT4 chart history 1 support chart will be opened! This function can be deactivated. I wish you many green pips in the future. 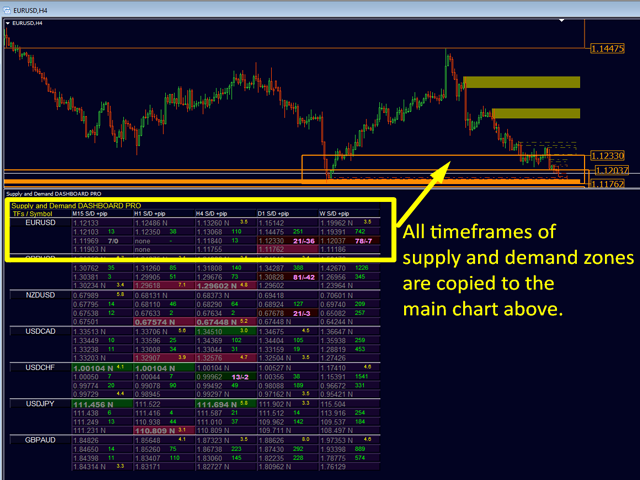 Made some changes to minimum Zone Drop to be align with Advanced Supply Demand indicator. Re-activated the function for pivot and yesterdays high-low-open lines. Added a message print on screen for last alert with time of alert. 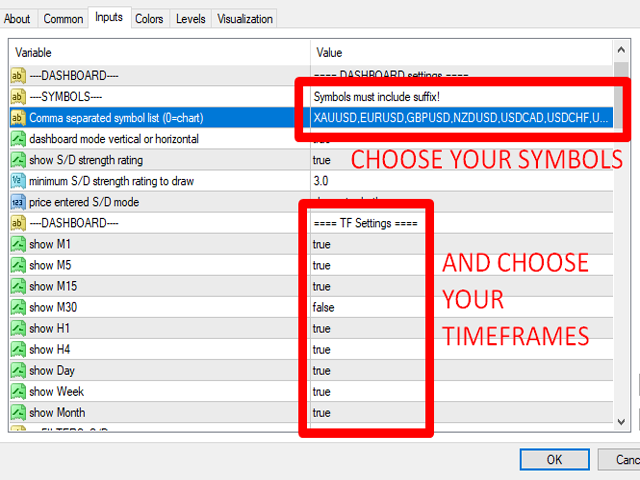 You can choose if the time shows broker time or your PC time. Added an option to show less digital points.